extendedReach has the ability to hide confidential information from users who have access to a case records (such as the case name and dates of service), but do not have a need to see certain details (such as social security numbers and case notes). The ability to hide confidential information is a system-wide option that must be enabled by an agency administrator. This article will explain what is considered confidential information in extendedReach, as well as who will have access to this information when this option is enabled. If you have a question not addressed here, you can search at the bottom of this article in Related Topics or your can Contact Support. For access to confidential information to be restricted, an agency administrator must first enable the following option in the Organization Preferences: “System: Hide confidential information (case notes and file attachments) from staff not associated with case/home”. Any worker assigned to case (listed on General Tab). The direct supervisor of the above worker. The user has access to all confidential information associated with the case (using criteria listed above). The user is the “Performed by” worker. The user is the “Performed By” worker’s supervisor. The user is listed in the “Submit To” workflow for approval. 2. 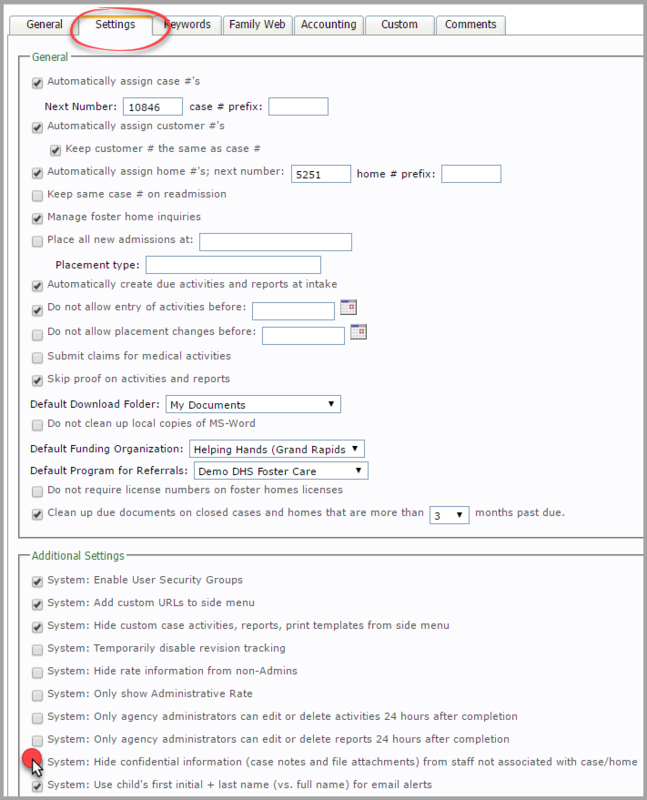 Add new activities and reports for cases. “Download Files” link (on the Case File tab). “Show: Case Notes” filter (on the Case File tab). Print “Case Notes” option on the Print Menu. The words “- Confidential Information Not Displayed -” or “Confidential” will appear instead of the information/file.